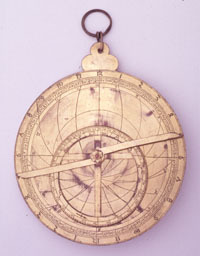 An astrological astrolabe from the Whipple Museum. Purchased with the aid of a grant from the PRISM fund. 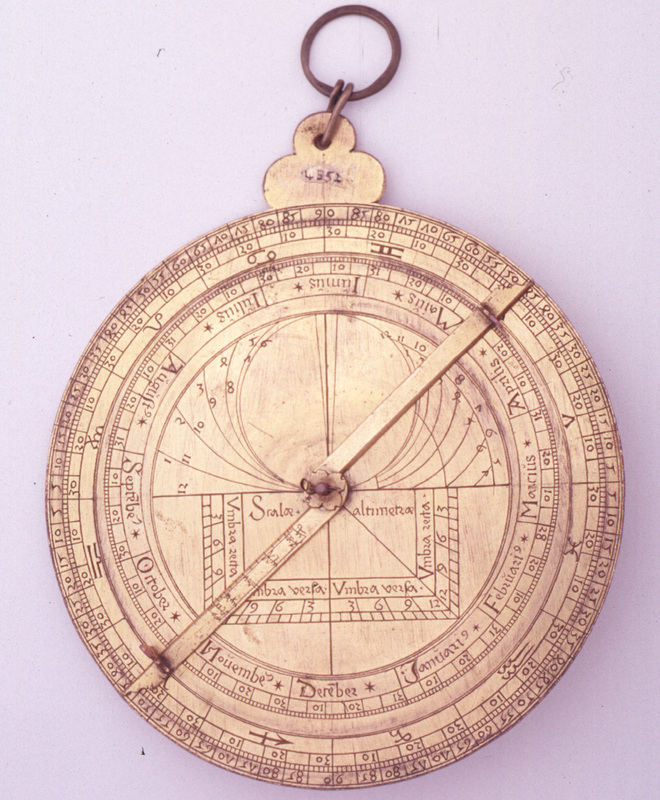 During his years in Vienna, Regiomontanus composed a tract on the construction and use of the astrolabe. Documentary evidence suggests that he later designed several of these instruments, including one presented to King Matthias of Hungary which is now lost. An extant piece of 1462, signed "IOHANNES" and dedicated to Cardinal Bessarion, is probably by Regiomontanus. At least eleven other "Regiomontanus-type" German astrolabes of the fifteenth century, with significant similarities to the Bessarion instrument, survive, indicating a distinct tradition which Regiomontanus established or participated in. The retia of these instruments are based on an earlier Italian form, and they feature Roman lettering as well as Gothic script. (Regiomontanus introduced the Roman font to Nuremberg when he established his printing press there). It is apparent that elements of their design were adopted by Johannes Stöffler (1452-1531), the first Professor of Mathematics and Astronomy at Tübingen University, and Georg Hartmann (1489-1564), the leading Nuremberg instrument-maker of the early-sixteenth century. The Bessarion astrolabe, and several others in the same tradition, have on the reverse an organum Ptolemei: a projection valid at any latitude for determining the time in equinoctial hours from the altitude of the sun for any latitude. This projection, with the addition of stellar positions, is the basis of the form of universal astrolabe commonly (but for this reason misleadingly) called the Rojas-type, after a publication by Juan de Rojas which described it in 1550. Regiomontanus himself is known to studied this theory in the treatises of earlier Viennese mathematicians. One of the instrument-makers to whom astrolabes have been attributed which resemble the Bessarion instrument is the Benedictine monk Hans Dorn (d. 1509) of Vienna. Several other instruments of a quite different character, including one dated 1491, have also been attributed to Dorn. 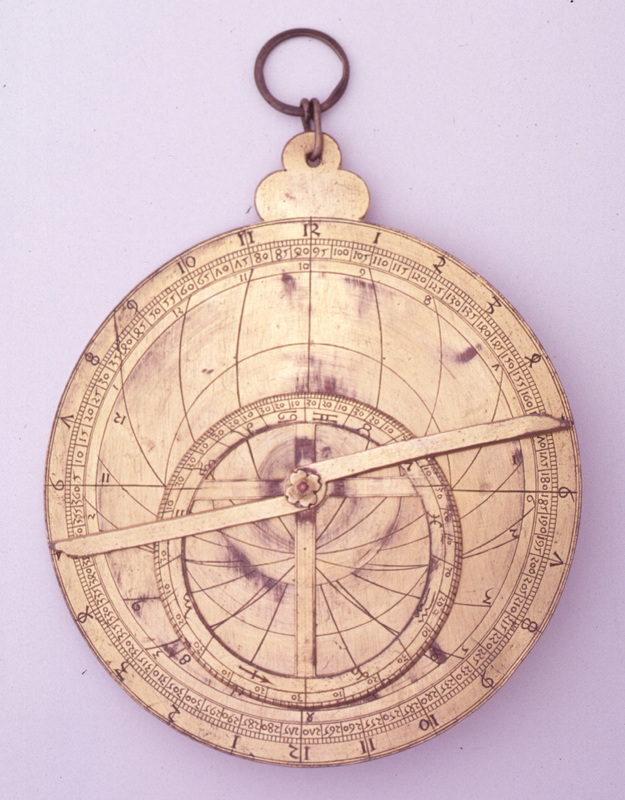 The astrological astrolabe shown here, from the collections of the Whipple Museum, resembles that piece and other German astrological astrolabes of the early-sixteenth century. Thus, while this instrument is not associated directly with the astrolabe-making tradition of Regiomontanus, it may stem from a parallel and related tradition.